Online Approval allows individuals, whose institution is using Time2Track, to submit Time2Track activities for approval to their supervisors electronically. Supervisors can sign off on hours online through Time2Track, which cuts out the need for paper copies and physical signatures. The entire process is tracked in Time2Track so institutional administrators can stay on top of the status. Time2Track Online Approval is an optional feature that lets you submit your hours to your supervisor for approval electronically through Time2Track. Supervisors can sign off on hours online through Time2Track, which cuts out the need for paper copies and physical signatures. The entire process is tracked in Time2Track so institutional administrators can stay on top of the status. Online Approval has to be initiated and set up by your program, so check with them if you don’t see the Approvals tab. If your program is not using Online Approval, you can still get your hours approved by printing a report for your supervisor to sign. To start tracking hours that can be approved by your supervisors, you’ll first need to add a Placement. In Time2Track, a Placement refers to training or work experiences like practicums, field placements, externships, internships, or other types of work experience. DON'T SEE THE PLACEMENTS SECTION? If you don't see the Approvals tab or Placements section, this means that your school has not set up or turned on Online Approval for their students. 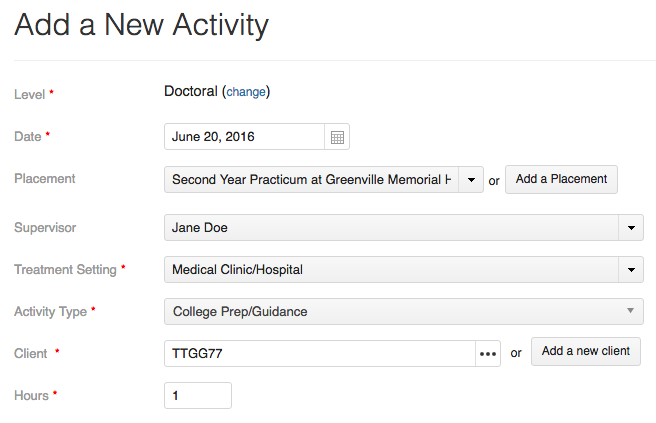 Online Approval is currently only available to Time2Track Institutional users and their students and trainees. Your school will need to have a Time2Track account and set up Online Approval options for you to use this feature. Have your DCT or Program Director email us at sales@time2track.com for more information or refer your program and we will contact them. Click Placements under the gear icon. Select your Level, then select the appropriate Course, Training Site, and Term. Indicate your preferred Supervisor – this will be used as your default when adding activities (you can always change it for each activity). If you’re training at multiple sites, go ahead and add separate Placements for those as well. Keep in mind that the options you see for Course, Training Site, Supervisor, Term, and Supervisor are added by your program. If you don’t see the option you need, contact your program’s Training Director or Time2Track Administrator and they can add it for you. Now that you've added a Placement, you can start tracking activities that can be approved by your supervisors. Do you have previously logged activities that need to be approved? 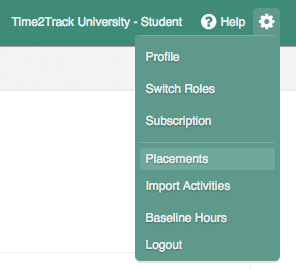 If you started using Time2Track on your own, chances are you need to add placement and supervisor information to your previously logged activities. You can do this easily with our bulk editing tool. When you add a new activity, you'll see options for indicating your Placement and Supervisor. 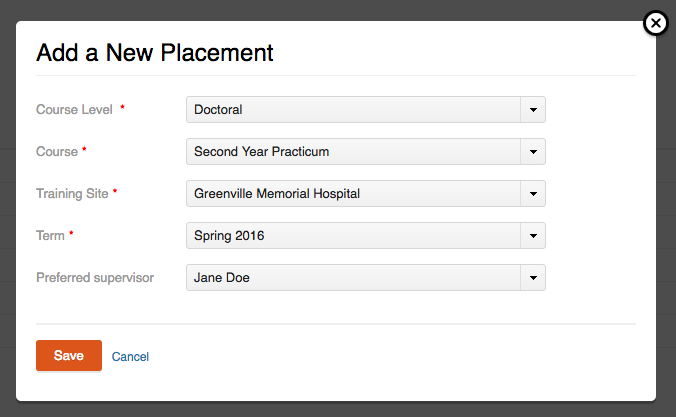 The Placement name is made up of the Course, Training Site, and Term you selected when you added your Placement. This information is used to connect a particular activity with the appropriate supervisor. If you need to add another placement, or if you have a placement that spans more than one term, add a new placement by following the steps above.